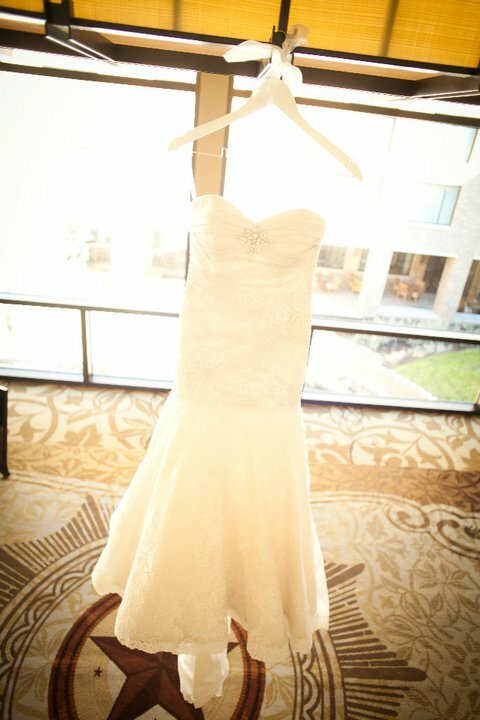 Oh the dress, the most important aspect of the entire wedding. The dress says so much about the bride, her personality, her character, her confidence and of course her style. Prior to even getting engaged, I was mildly obsessed with Say Yes To The Dress (I think every woman is!) and it was the first thing I wanted to do when I had the ring on my finger! I actually had to go to D.C. for work a mere 3 days after we'd gotten engaged which was kind of a bummer but I brought at least 8 bridal magazines on my trip! I started ripping out pictures of cakes, flowers and lighting I liked and only ended up ripping out ONE picture of a dress...and that was the dress I ended up buying! I set up 3 dress appointments one Saturday with my mom and a few of my bridesmaids. We hit David's Bridal first so my bridesmaids could try on their dresses and I ended up really liking a dress I tried on! It was pretty and cheap but I knew I shouldn't buy the first dress I liked (and I still wanted to try on THAT dress I found in a magazine). My second appointment was Belle Saison Bridal where I had called ahead to make sure they had the dress I wanted to try on. It was the first I tried on and I immediately fell in love! I am a pretty indecisive person so I had my mom and bridesmaids pick out other dresses for me to try on. I liked a lot of them, wedding dresses are so beautiful, but nothing compared to the first dress. I was down to the last dress which I also like A LOT and now I was torn. I wish I had a picture of it to compare but I went with my gut instinct and chose the Allure dress I tore out of a magazine (I made the decision on the fact that the Allure dress had faux buttons and zipped up the back and the other dress was full corset!). I said Yes To The Dress! People talk about that AHA moment or talk about starting to tear up when they try on "the dress" but I just felt like me in the dress. I knew Jon would love it and I kept thinking about the look on his face when he would see me. 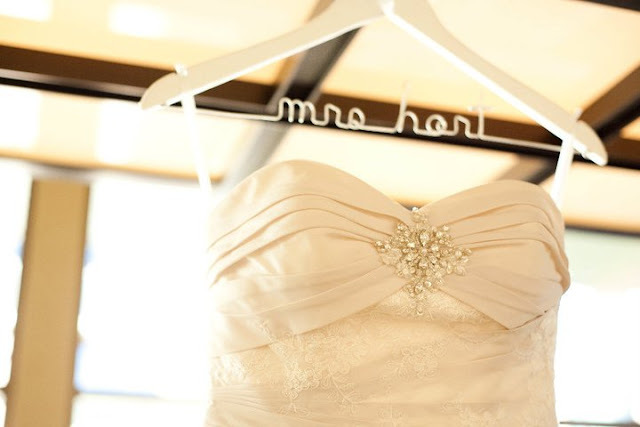 The dress was strapless with a sweetheart top and a mermaid shape. The train was a lot longer than I thought I would ever have (considering I am pushing 5 feet tall) but it bussled beautifully. My favorite part was the intricate beading on the front which was just enough bling for me and the lace gave it such a classy feel. Obviously the dress, shoes and veil were my "something new" and I borrowed a gorgeous pair of earrings from my bridesmaid Mary Amanda as my "something borrowed" (she actually wore them on her wedding day and my other bridesmaid Leah is wearing them on hers!). 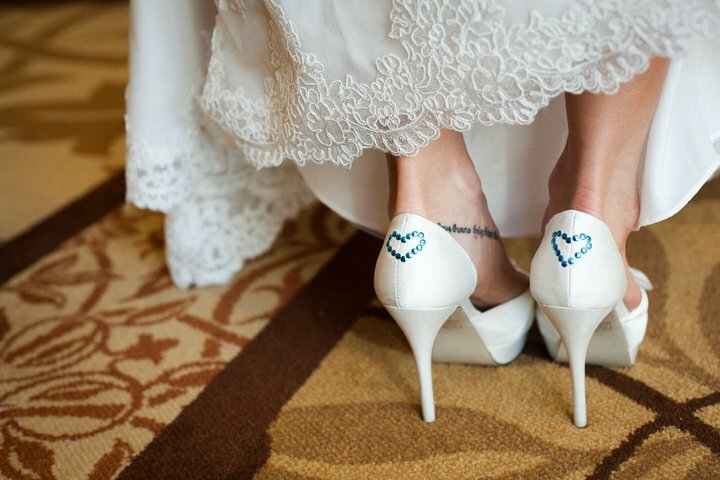 My "something old" was a six pence taped to my shoe from my mom, they are said to be good luck on your wedding day! I was so sad to take my dress off after the wedding, knowing I would never wear it again :-( and even more sad when my mom took it to the bridal shop to get cleaned and vacuum packed. I know times will change and in 30 years I may look back and think "what the heck was I thinking with that dress" but I have high hopes of my daughter one day wearing my dress. I know it is far fetched so I have a backup plan....my mom has her wedding dress saved and is planning on making a Christening/Baptismal gown for her grandchildren to wear out of the fabric so I may do the same, I just don't want to get rid of it!! 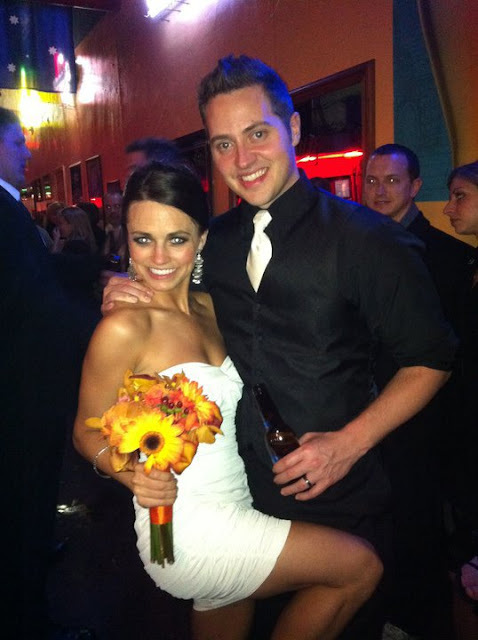 I was an Allure bride too! Different style, but I absolutely LOVED their use of the faux button zip as well!!! That dress is absolutely stunning on you. Lovely. Nope - you're daughter will love it! Some things are timeless! You're shoes are fabulous, btw. And what does your tattoo say? ?